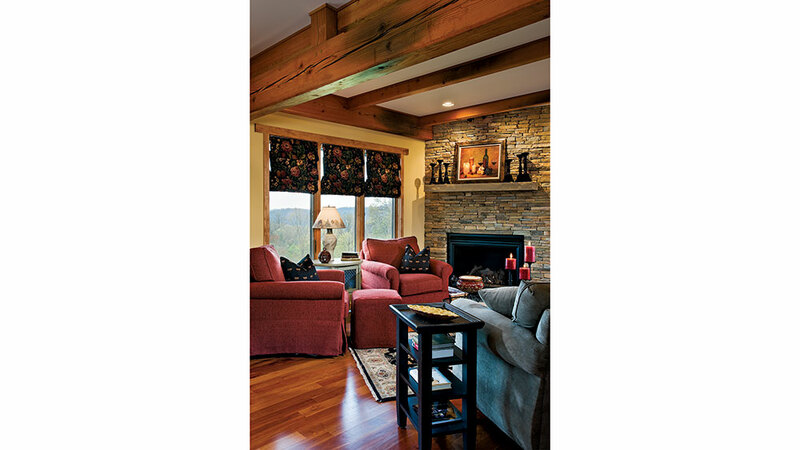 Several years ago Nancy and Jim McFadden began a search for a timber-frame home fitting their notion of a mountain retreat that would one day become their permanent residence. They visited a number of timber-frame companies in different states and stayed in model homes, only to discover that what they were looking for was almost in their own back yard. One day when they were visiting the Château Morrisette Winery (for more on the winery see p. 24), just off the Blue Ridge Parkway in Floyd County, Virginia, they were struck by the beauty and workmanship of the timber frame structure. They learned the timber frame had been built by Blue Ridge Timberwrights and knew they had found what they were looking for. “We had previously purchased a parcel of land in Ashe County, North Carolina, but as time went by, we realized the plans for the subdivision would not meet our need for full-time residency. We were able to sell that property and buy almost 13 acres in neighboring Alleghany County near Sparta, just a few miles from the Blue Ridge Parkway,” Jim says. 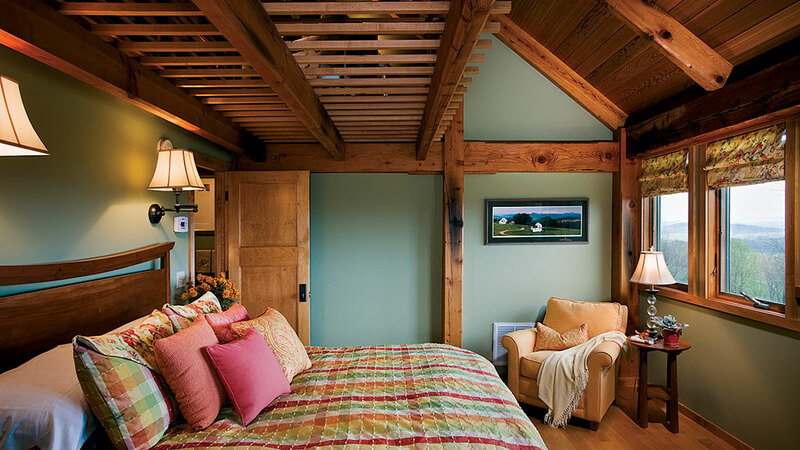 An impetus for Jim and Nancy’s interest in a timber frame was their desire to utilize the salvaged lumber they had previously acquired from Blue Ridge Timberwrights. Douglas fir timbers once used as floating docks on the St. Lawrence Seaway would lend a special piece of history. Since the timbers had been floating in salt water for 90 years, they were well preserved and had maintained their character. Nancy and Jim weren’t interested in a mammoth, cathedral-style home, but rather wanted to incorporate many of the concepts set forth by Sarah Susanka in The Not So Big House. In an effort to fully utilize her philosophy, the couple contacted SALA Architects, the second iteration of the firm Susanka had co-founded before leaving to focus on her successful writing career. The McFaddens’ inquiry led to SALA principal, Katherine Hillbrand, who had expertise in the design of timber-frame homes. The couple wanted large gables, which for them was the epitome of the connotation of such a home. They also were drawn to elements denoting an Asian feel. Nancy and Jim describe the home design as perfect, just the right size for the two of them. In lieu of extra dedicated bedrooms that would be used only infrequently, their SALA design team created activity spaces, which could be converted to sleeping spaces near the bathrooms. For family visits by Jim’s daughters Jenny, Kate and Joanna, and Nancy’s son Phillip, the McFadden property contains a circa 1978 vintage three-bedroom, two-bath Lincoln-log style guest cabin just 30 yards from the main house. With 3,700-square feet on four levels, the full timber-frame home contains an open living room immediately inside the front entry with the eating area and kitchen flowing seamlessly around to the back of the home. An “away room,” which can be used for reading, computer work, or quiet activity, is tucked behind the stairs on the main level and is equipped with an office workspace and a trundle bed. The homeowners included a full-bath nearby. If a permanent first level sleeping space should be needed in the future, the away room could be converted. A two-story staircase ascends to the loft with a library-style hallway lined with bookshelves on the second level landing leading to the couple’s private sleeping and living space. In addition to their bedroom with a full bath and large walk-in closet, there is a hobby room, which also could double as a bedroom, and a combination bath-laundry room. Instead of an attic, the owners opted to finish the third-story loft with a yoga and music room on one side of the walkway bridge and Jim’s home office and photography studio on the other. They finished approximately one-half of the walkout basement level as a large recreational space with the remaining area devoted to storage and mechanical equipment. During the time when the McFaddens were still planning to build in Ashe County, they had contacted David Caldwell, owner of James Caldwell Construction Company to serve as their general contractor and builder. Even after they changed building locations, they still wanted David to build their new timber frame home. Minimalist is the word Nancy and Jim use to describe their decorating side, which favors the Arts and Crafts colors gold, green and red. “A bit on the funky side,” Nancy says. Outside the home, excavated granite and quartz have become part of the landscape along with Japanese maples to contribute to the Asian feel, as expressed in the free-standing cypress arbor. An arrangement with a neighbor farmer to let his cows graze the native grass on part of their land is beneficial to both, because it leaves Jim only the small lawn and the formal gardens to maintain. During the summer months, Jim and Nancy enjoy growing a vegetable garden. In the fall, they find themselves canning and making tomato juice. When they are not occupied with their home maintenance responsibilities, they have the benefit of readily available outdoor activities, such as riding mountain bikes, hiking or canoeing in the nearby New River, one of the American Heritage Rivers of the United States. As a landscape-photography enthusiast, Jim describes the area as a target- rich environment. 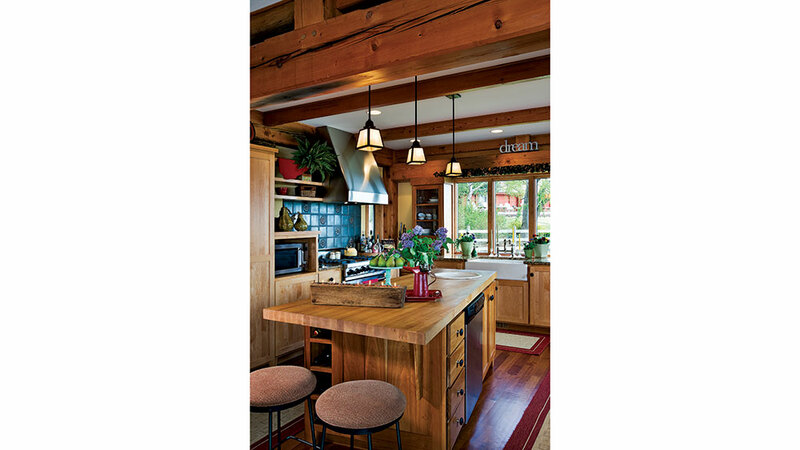 Once homeowners Nancy and Jim McFadden settled on a Virginia location for their timber home, Nancy decided to design a “cook’s kitchen” in the home with granite countertops. She eliminated some upper cabinets in favor of additional windows. 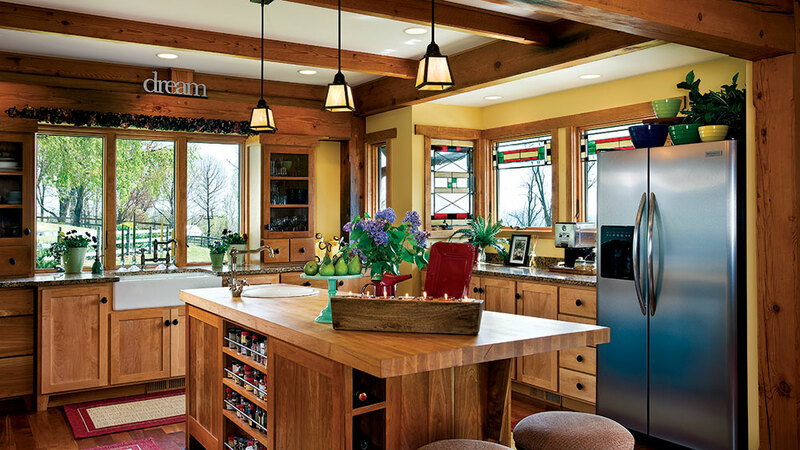 Dave Biggerstaff of White Dove Woodworks made maple cabinets with a picture-frame design and natural-stone knobs. Tennessee field stone faces the gas-burning fireplace where the homeowners can relax and enjoy the view of the North Carolina landscape. Nancy opted for plain fabrics for the furnishings and used patterned rugs and window treatments to enhance the decor. 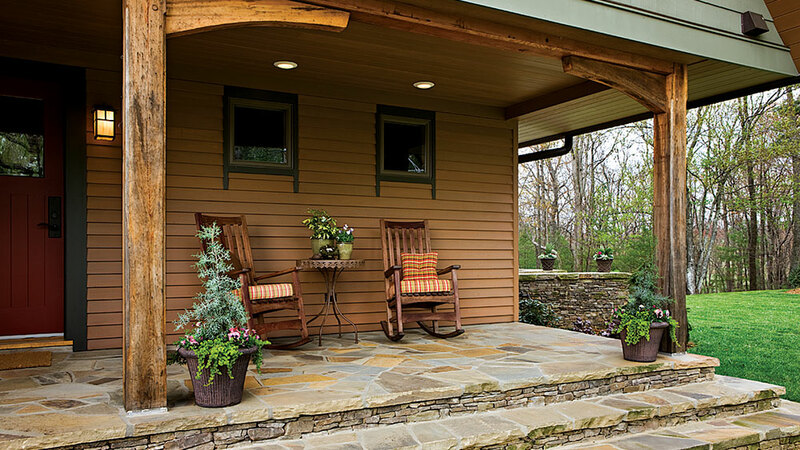 Blue Ridge Timberwrights utilized the Asian style of heavy timbers and short posts. Nancy selected a tile backsplash that has the appearance of brushed stainless steel to accentuate the patina of the dual-fuel gas cooktop with an electric oven and custom-made exhaust hood. The dishwasher is handily positioned in the cherry island. The guest cabin is visible through the windows above the apron-front sink. 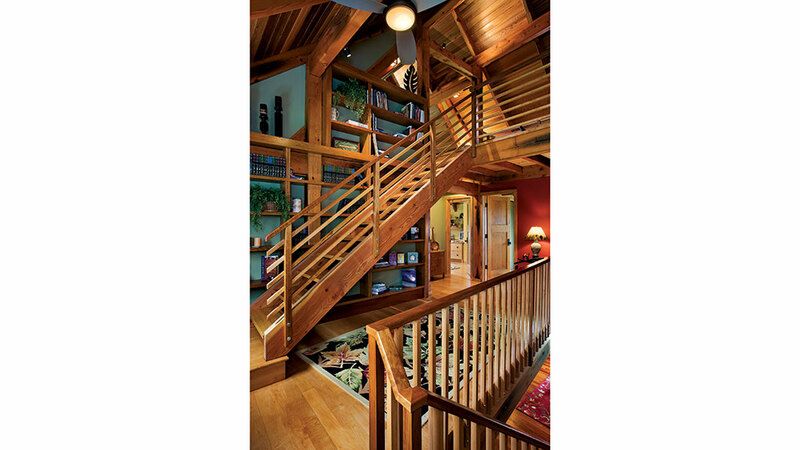 Maple risers and railings and cherry steps form the two sections of staircase which meet on the second story landing. The bookcase fills the two-story gable wall. The loft ceiling is finished with tongue-and-groove Western red cedar. 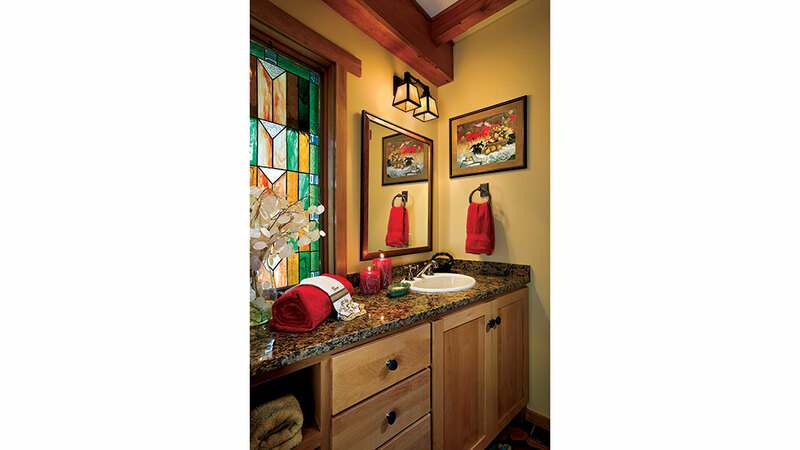 To ensure privacy in the main level powder room, Nancy installed a stained glass window instead of a shade. The vanity tapers toward the door to visually open the space. Heavy timbers accentuate the high ceilings throughout the home. 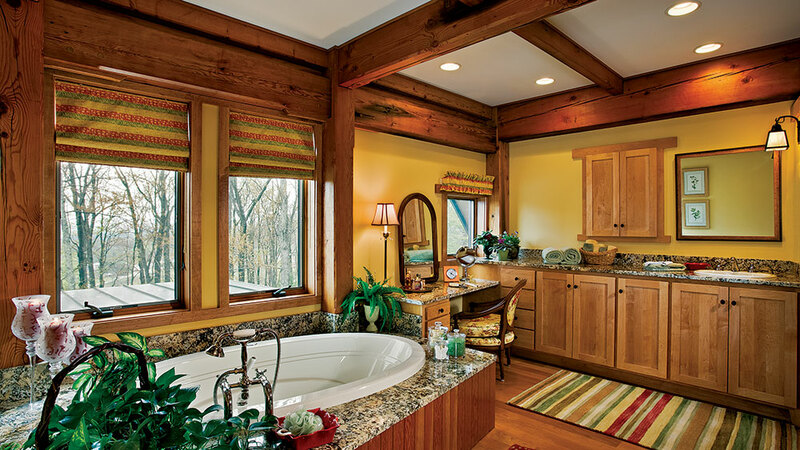 Granite tops the vanity and Douglas fir tongue-and-groove surrounds the air-jetted tub. The homeowners installed maple floors throughout the second story. The loft bridge is constructed of Douglas fir in an open lattice pattern, contributing even further to the openness of the home by allowing Jim and Nancy a view of the timber frame loft ceiling from their master bedroom. 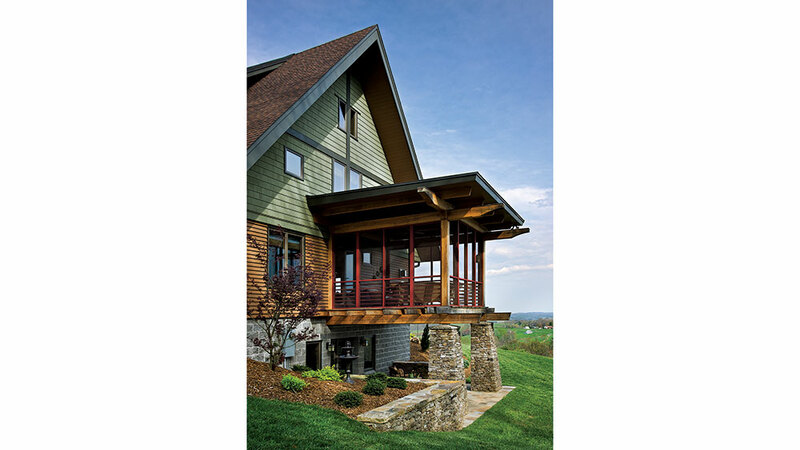 Green sawn cedar shakes, tan lap cedar siding, and red ship-lapped Western red cedar give this timber frame home architectural appeal.